Over the past 24-hours the World Health Organisation has confirmed another outbreak of Ebola Virus Disease (EVD), this time in the Democratic Republic of Congo. Although the Ebola species hasn’t yet been confirmed Ian M. Mackay (who knows a thing or two about this subject) suspects it might be Sudan Ebolavirus (read his excellent post and view his infographic here). To give you an idea where Equateur province is in relation to the DRC I’ve put together an infographic but have failed to locate where Ikanamongo Village is (where the index case ate the bush animal, possibly a bat and became ill). 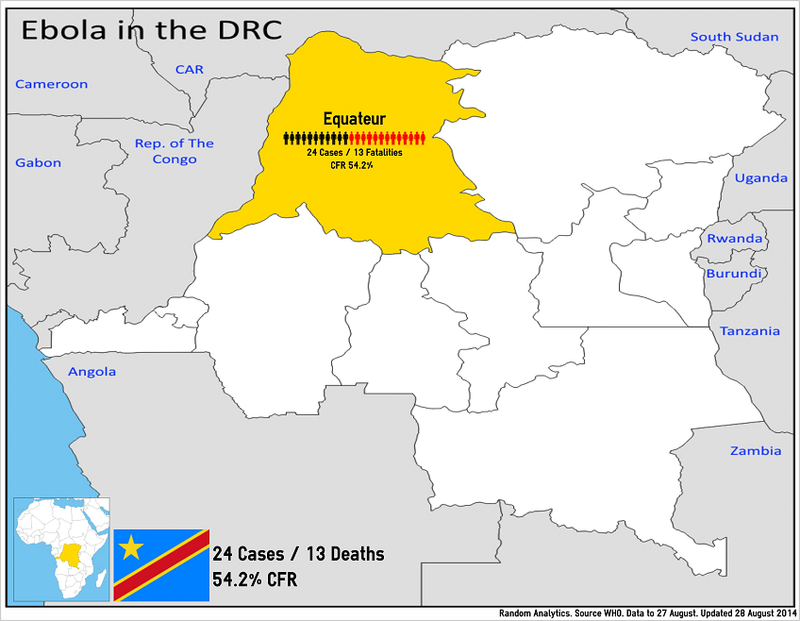 According to my historical reckoning this would be the eighth outbreak of EVD in the DRC, six of Ebola Zaire, one of Ebola Bundibugyo and the most recent which remains unconfirmed. It should be noted that my count includes the retrospective confirmation of Ebola Zaire from 1972. If it does turn out to be a variant of Ebola Sudan then this would be the ninth iteration of the disease with 3 confirmations in what is now South Sudan, four in Uganda, one accidental infection in the UK and potentially the most recent DRC outbreak. On 26 August 2014, the Ministry of Health, Democratic Republic of Congo (DRC) notified the World Health Organization (WHO) of an outbreak of Ebola virus disease (EVD) in Equateur Province. The index case was a pregnant woman from Ikanamongo Village who butchered a bush animal that had been killed and given to her by her husband. She became ill with symptoms of EVD and reported to a private clinic in Isaka Village. On 11 August 2014, she died of a then-unidentified haemorrhagic fever. Local customs and rituals associated with death meant that several health-care workers were exposed and presented with similar symptoms in the following week. Between 28 July and 18 August 2014, a total of 24 suspected cases of haemorrhagic fever, including 13 deaths, have been identified. Human-to-human transmission has been established and includes the health-care personnel who were exposed to the deceased pregnant woman during surgery (one doctor and two nurses) in addition to the hygienist and a ward boy, all of whom developed symptoms and died. Other deaths have been recorded among the relatives who attended the index case, individuals who were in contact with the clinic staff, and those who handled the bodies of the deceased during funerals. The other 11 cases are currently being treated in isolation centres. Samples have been sent to laboratories in Kinshasa and in Gabon for confirmation of EVD and to identify the strain. The index case and the 80 contacts have no history of travel to the EVD-affected countries in West Africa (Guinea, Liberia, Nigeria, or Sierra Leone) or history of contact with individuals from the affected areas. At this time, it is believed that the outbreak in DRC is unrelated to the ongoing outbreak in west Africa. d-maps.com. Africa: states, main cities. Accessed 28 August 2014.
 d-maps.com. Democratic Republic of the Congo / République Democratique du Congo: boundaries, provinces, main cities. Accessed 26 August 2014. Wikipedia. File:Flag of the Democratic Republic of the Congo.svg. Accessed 28 August 2014. World Health Organisation. Ebola virus disease – Democratic Republic of Congo Disease outbreak news 27 August 2014. Accessed 28 August 2014. I continue to remain morbidly fascinated by Ebola. The World Health Organisation (WHO) states that EHF is a severe acute viral illness often characterized by the sudden onset of fever, intense weakness, muscle pain, headache and sore throat. This is followed by vomiting, diarrhoea, rash, impaired kidney and liver function, and in some cases, both internal and external bleeding. Laboratory findings show low counts of white blood cells and platelets as well as elevated liver enzymes. People are infectious as long as their blood and secretions contain the virus. Ebola virus was isolated from seminal fluid up to the 61st day after the onset of illness in a laboratory acquired case. The incubation period (interval from infection to onset of symptoms) varies between 2 to 21 days. During EHF outbreaks, the case-fatality rate for the three fatal strains has varied from outbreak to outbreak between 24.8% and 89.5%. The Ebola virus causes severe viral haemorrhagic fever (VHF) outbreaks in humans. Viral haemorrhagic fever outbreaks have a case fatality rate of up to 90%. Ebola haemorrhagic fever outbreaks occur primarily in remote villages in Central and West Africa, near tropical rainforests. There is no treatment or vaccine available for either people or animals. There were three outbreaks of EHF in 2012, two occurring in August and a later outbreak in November. The first two were almost concurrent outbreaks, one of Ebola Sudan in Uganda and another of Ebola Bundibugyo in the Democratic Republic of Congo. The Uganda outbreak, in the Kibaale District would infect 24 and kill 17 including 12 members of the same family. The DRC outbreak, in the Province Orientale would eventually infect 77 and kill 36. Barely a month after calling and end to Kibaale outbreak (and coincidentally an outbreak of Marburg) the Ugandan Ministry of Health had to deal with a second Ebola Sudan occurrence. The 2nd Ugandan outbreak, this time in the Luweero and Kampala Districts would infect seven and kill four. As recently as late May 2013 it was thought that another outbreak had occurred in the DRC. Although there was an occurrence of some disease testing found that it was not EHF as noted by the CIDRAP News scan on the 4th June 2013. 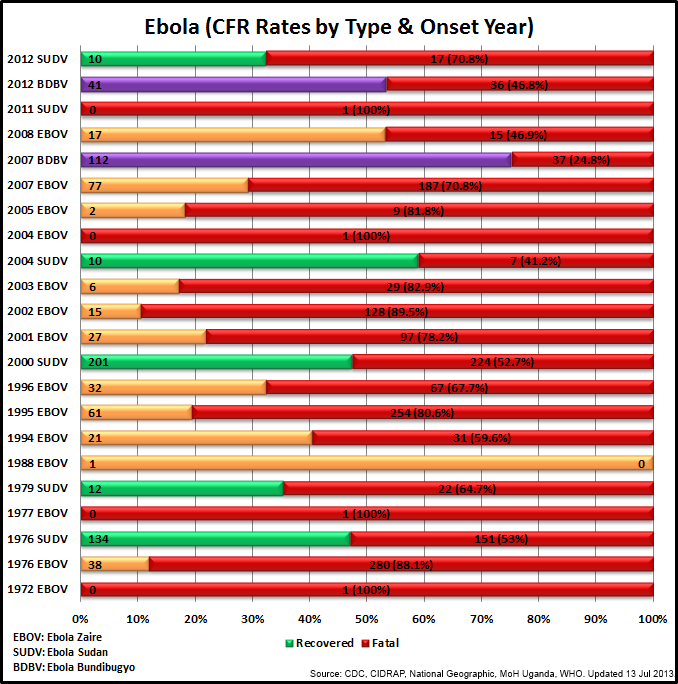 There has also been some discussion about the possible progress in the fight against Ebola via an FDA research program in late June 2013 (a good abstract on this via H5N1) I thought it might be time to review one of my first WordPress articles, a piece on Ebola completed in October 2012. 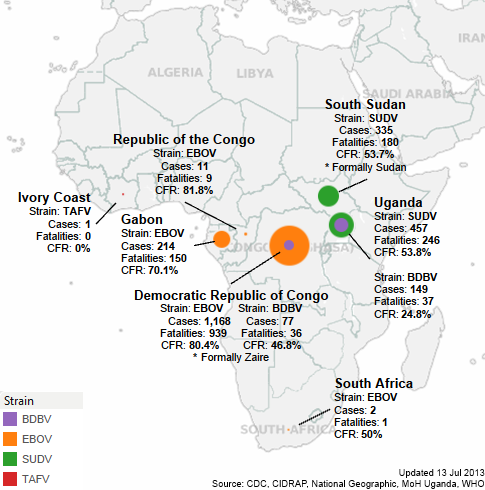 Here is some spruced up analysis and analytics, including some updated data from the 2012 outbreaks in Uganda and the Democratic Republic of Congo. 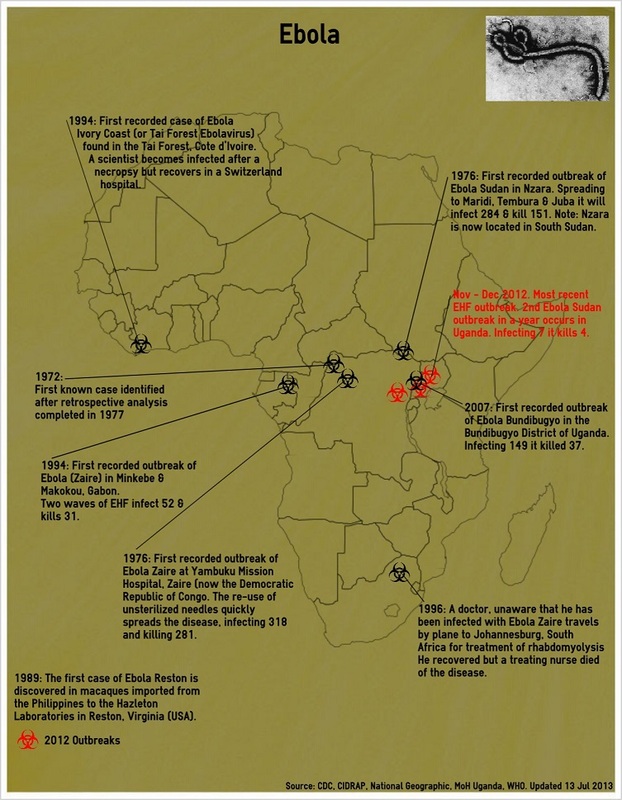 The following infographic looks at some of the key dates and incidents in the history of the Ebola Haemorrhagic Fever (EHF). If you also want an idea of what the virus looks like I have included a photo of the disease under an electron micrograph (top right hand corner!). TAFV: Ebola Ivory Coast (or the Tai Forest Virus). Colour Brown. Each country has additional details including total number of cases, fatalities and Case Fatality Rate (CFR). It should be noted that I have not included a number of known laboratory incidents which have occurred outside of Africa and have resulted in at least one death (Koltsovo, Russia). I also have not included any details about the Ebola Reston which was exported in Philippine crab-eating macaque monkeys to the United States and Italy from 1989 through to 1992. Ebola Reston is not known to be dangerous to humans. Note: I have created this infographic using Tableau Public software which can be viewed here. The final infographic looks at the Case Fatality Rates. Each line represents a known occurrence of Ebola by onset year. If the outbreak has not completed within a calendar year the data is included from the date of the first onset. Thus the Dec 2008 – Feb 2009 Kasai-Occidental Ebola Zaire outbreak in the Democratic Republic of Congo which infected 32 and killed 15 is included as the 2008 EBOV line. Although there have been no known outbreaks of EHF in 2013 it remains a highly visible reminder of our inability to completely dominate our natural space. Many other diseases infect, damage and kill more people but Ebola seems to have a special place in our high-speed mythology. No doubt this is due to its awful characteristics and super high case fatality rates. Amplification by movies such as Outbreak (made in 1995 but still watchable today) or by the writings of Tom Clancy and others who consistently turn the disease into a weapon adds to its macabre allure. We are just a month away from August, the onset timings for both the opening 2012 outbreaks. Will 2013 prove to be another deadly year? Acknowledgements: The new and improved analysis could not have happened without Crawford Kilian and his H5N1 blog and the writings of Tara C. Smith (including her early work via Stanford University) but more recently her articles for National Geographic. Each disease I look at brings out a couple of new, highly specialised subject matter experts and Tara’s writings are excellent. I have been fascinated by Ebola Haemorrhagic Fever since reading ‘The Hot Zone’ by Richard Preston in the mid-1990s. For those of you who are not aware Ebola Haemorrhagic Fever (EHF) is a severe acute viral illness often characterized by the sudden onset of fever, intense weakness, muscle pain, headache and sore throat. This is followed by vomiting, diarrhoea, rash, impaired kidney and liver function, and in some cases, both internal and external bleeding. Laboratory findings show low counts of white blood cells and platelets as well as elevated liver enzymes. People are infectious as long as their blood and secretions contain the virus. Ebola virus was isolated from seminal fluid up to the 61st day after the onset of illness in a laboratory acquired case. The incubation period (interval from infection to onset of symptoms) varies between 2 to 21 days. During EHF outbreaks, the case-fatality rate has varied from outbreak to outbreak between 25% and 90%. To emphasise the case to mortality rates which are extremely high I have broken down the figures for outbreaks by year. As you can see from Figure 1 there is a higher density of red over green, reflecting the overall 66.5% mortality rate from the three confirmed lethal strains of Ebola Zaire, Sudan and Bundibugyo) plus the one confirmed case of Ebola Ivory Coast. 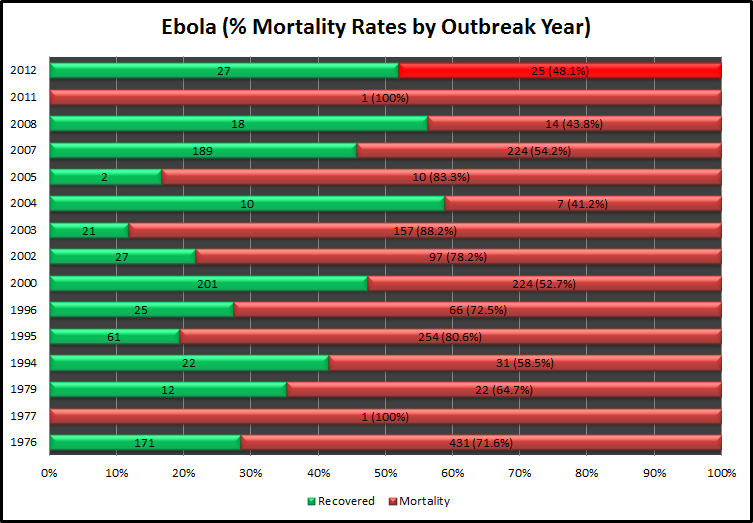 Figure 1: Ebola Mortality Rates 1976 – 2012 (provisional data for 2012). Data sourced from the World Health Organisation. The latest outbreak of Ebola in the DRC reflects the burden that country has in both cases and mortality. The next graph reflects the almost half share of mortality that the DRC experiences of all recorded cases since 1976 but with only 41.8% of actual cases also confirms a higher mortality rate compared to other impacted countries. No doubt this is due to it being the least developed country in the world. 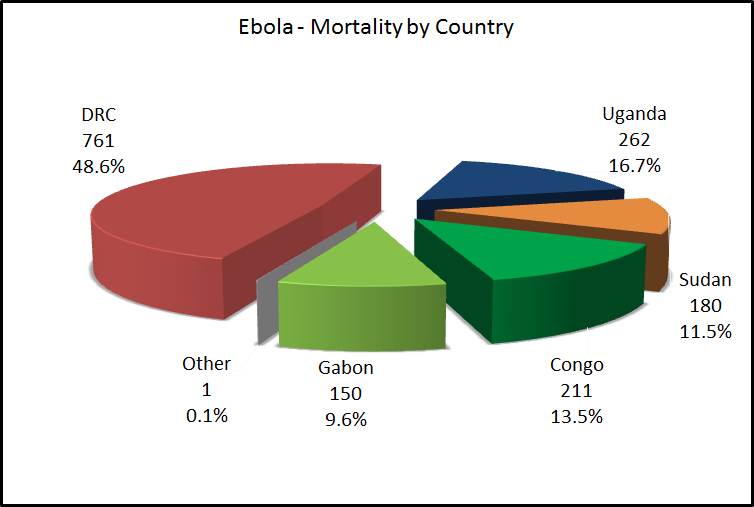 Figure 2: Ebola Mortality Figures by Country 1976 – 2012. Data sourced from the World Health Organisation. 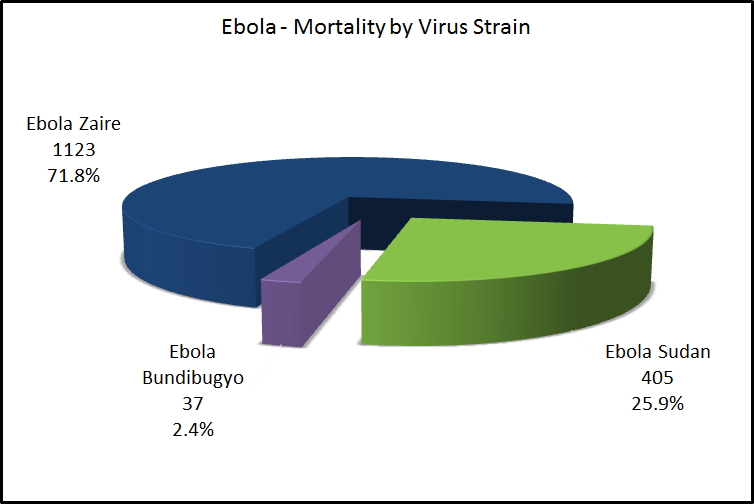 The last graph shows a breakdown of mortality figures by virus strain. There are currently five known variants of Ebola. They are Ebola Zaire, Sudan, Bundibugyo, Ivory Coast and Reston although only the first three variants have been confirmed as being fatal. Figure 2: Ebola Mortality Figures by Virus Strain 1976 – 2012. Data sourced from the World Health Organisation. Although Ebola has never caused a confirmed fatality outside of continental Africa the Reston strain has been imported into the United States on a number of occasions (via macaque monkeys in 1989, 1990 and 1996) and Italy once in 1992. Given its very high mortality rate once infected it is one of the scariest of diseases. There is no treatment or vaccine available so let us only hope that it continues to lay dormant and the current outbreak is contained as soon as possible by the local authorities supported by international agencies such as the World Health Organisation. “The latest outbreak of Ebola in the Democratic Republic of Congo ends after claiming 34 lives, says Health Minister Felix Kabange Numbi. If you want to look at two economies who sit as far away from each other in terms of economic prosperity in the year 2012, then you need go no further than a comparison between the China and the Democratic Republic of Congo (DRC). 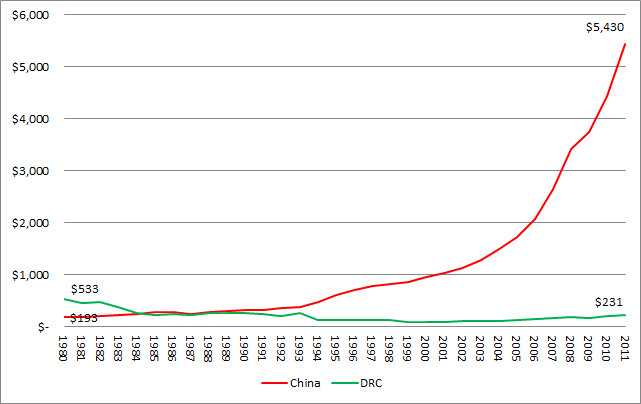 Figure 1: GDP per Capita (PPP $) of China and the Democratic Republic of the Congo. Data sourced from the World Bank. Just 30-odd years before, Zaire (as the Democratic Republic of the Congo was then known) with its 35.6 million population actually boasted a GDP of $14.39Bn USD and a GDP per capita of $533. China on the other hand with its 1.139Bn citizens had a GDP of $189.4Bn which equalled a mere $193 per citizen. Backed by the fastest industrial revolution in history by 2011 Chinese GDP would increase to $7.3Tn (the second largest for any country after the US) and per Capita income would explode from $193 to $5,430. For its 1.344Tn citizens, roughly a fifth of the world’s population that would be a 27-fold increase in GDP per Capita and an 84% decrease in those living on less than $1.25 per day. Living on less than $1.25 per day is a standard measurement of absolute poverty adopted by the United Nations as part of its Millennium Development Goals. From being the second most industrialised African nation in 1960 and having rich agricultural and natural resource advantages Zaire would suffer throughout the 1980’s an exponential growth in corruption, known locally as le mal Zarois, or the Zairian sickness. According to Young, C. & Turner, T. (1985) by 1984 Mobuto Sese Seko had amassed $4Bn USD in personal wealth stolen from the state (effectively odious debt). Those billions of dollars stolen by the regime were not reinvested in the country’s infrastructure which had degraded significantly prior to the First and Second Congo Wars. These wars, aka Africa’s First World War, have cost the country and region more than 5-million lives since the commencement of bloodshed in 1996 along with enormous capital and infrastructure loss. From an economic standpoint this has left DRC and it’s almost doubled population of 67.7 million a GDP in 2011 of just $15.64Bn. The additional $1.25Bn USD growth over the previous 32-years represents an 8.65% increase or just 0.27% per annum. From a GDP per Capita perspective the $231 for each citizen is only 43% of the 1980 figure.